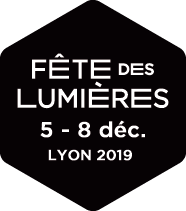 Fête des Lumières | Tropicbirds, flamingos and "lampounettes"
Silently and using energy-efficient technology, a cheerful and original festive illumination has appeared above the rue de la République. Wherever you are, look up and a flight of luminous flamingos and tropicbirds will catch your eye! Throughout the Fête, this installation is complemented with 4 groups of “ lampounettes”, giant lamps which are over 4 metres tall! This fascinating vista is the fruit of a collaboration between the Lyon-based designers at Pitaya and the lighting designers TILT from the Drôme département. "The Candles from the Heart"
Created by as a skills sponsorship programme. ...or using your email address.